The power of imagination is undeniable and this Positive Magic Potions kit might just be the little boost your child needs! You can use any size clear bottle and we have two sizes of labels you can print along with an instruction sheet that details the ability of each potion. FYI: We also have a tutorial on how to make the Upcycled Celtic Box shown. It’s super easy! Going to the dentist? Take 4 drops of Bravery. Studying for a test? A few drops of Mind Power should do the trick. There are a few fun one’s too such as Fairy Vision and Laughing Brew. 25 labels in all. DISCLAIMER: Only to be used for good. Results may vary. These potions did not work for me and I don’t know why.Can you please tell me why Nancy?Are they real?What if I was to put some drink in a bottle and attach a label or make a potion tag and attach it to a drink bottle but only write realistic types of potion names on the tags and labels will that work?Thank you! 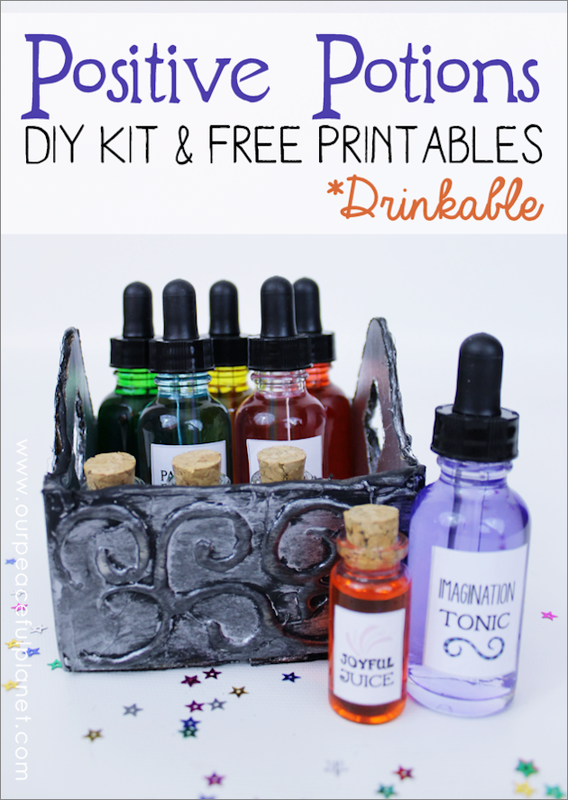 Good idea, but you should make recipes for potions that are yummy to drink and easy too!!! What a fun and imaginative project. I’d love to share some Joyful Juice with some adults I know. Congrats, you’re featured this week ont he #ThisIsHowWeRoll Link Party on Organized 31. Thanks so much Susan. I so appreciate the feature. I shared it on all my networks! This is a genius idea! I think we need a “homework tonic” lol! hehe… one that makes them love doing it. Good idea! What a cute and clever idea! What a fun way to remind yourself to change your mood! wow, amazing project and great to meet you on craft schooling sunday! Thanks so much! Glad to have found you! These are so wonderful! What a fun, creative, positive idea. I’m thinking it’d be cool too to add essential oils to them and use them for inhaling or rubbing on the temples, etc. So adorable. I could use a potion or two, myself. Cute! That would be a fun gift for anyone that needs a little boost, especially kids. Thanks for sharing with us at the #HomeMattersParty link party. These are too cute!! Would be great to make for a magical birthday party. Thanks for stopping by again Hil!